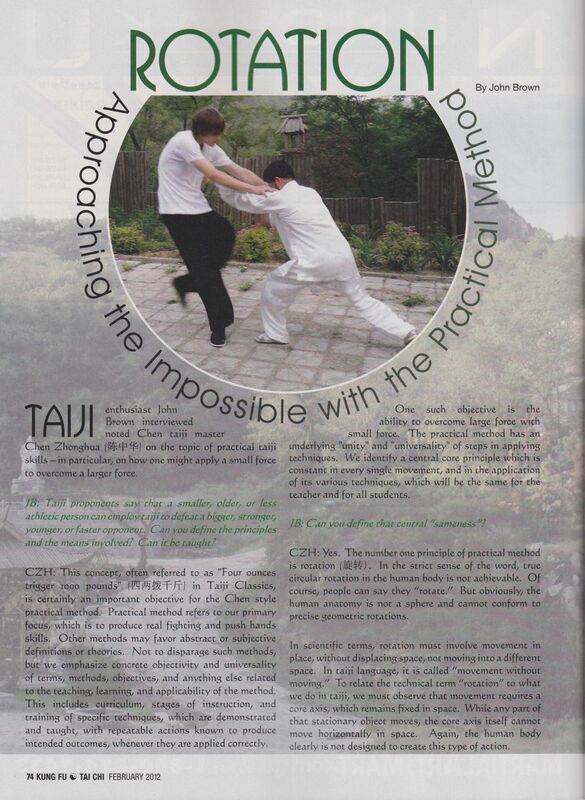 John Brown’s article Rotation: Approaching the impossible with the Practical Method was published by Kung Fu and Tai Chi Magazine in the Feb. 2012 issue. Here is a preview in jpg form. 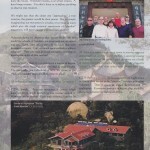 To read the entire article please purchase the magazine directly at www.kungfumagazine.com. John Brown has dozens of years of experience with Chen Style Taijiquan. Currently he studies Chen Style Taijiquan Practical Method from Master Chen Zhonghua. In 2007, he spent three months in the summer on Daqingshan Mountain Resort for Taiji at the full time taiji program hosted by Chen Zhonghua. This article is the result of his reflections during that period of learning. 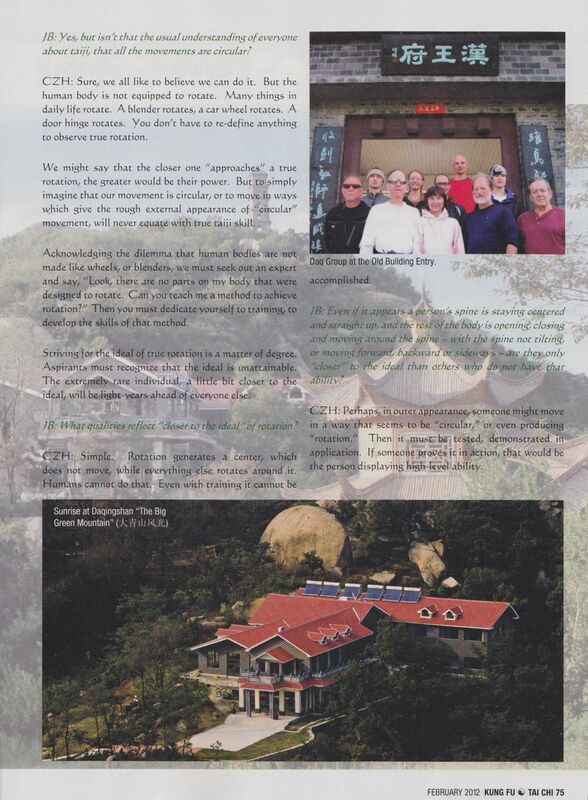 Following is the orignal full un-edited version of an article published in Kungfu Tai Chi Magazine, January 2012 issue. This article was extensively edited down to the text you will see below, before it was submitted for that issue. I was extremely disappointed that is had shrunk to such barebones status, minus introduction, history, and conclusion —–ommissions which eliminated critical background and foundational material, which I felt was essential, for the reader to gain a full appreciation of the principles and ideas Master Chen was sharing in this interview. In order to provide readers with the opportunity to get the full scoop, the original version is offered here, now in the second week of February. That is the date on which the March/April issue of Kungfu Tai CHi Magazine will be the current issue available on news stands and Bookstores. All readers are encouraged to also pick up a copy of the January/February issue, so you have a hard copy, to share, and so you can appreciate the layout and photos as they were arranged in the magazine. But now you can get a bit more background of some elements of the article, and get a bonus of seeing a few more pictures which didn’t make it into the news stand version. In 1992, after decades of “dabbling” in Taiji and other martial arts, I attended a workshop which featured Chen style Taijiquan. Fascinated with the style, whenever Chen style workshops convened within a thousand miles or so of my Midwestern home base, I would go for it. By 2003, I perceived some progress in my practice, while still feeling pretty inadequate in terms of how to “use” it, in hand to hand, practical applications. Then along came a “3 week summer intensive” in Arkansas, which was to feature the “Practical Method”, with emphasis on applications, and lots of push hands practice. “Practical Method” seemed somewhat “foreign” to me at first, with its emphasis on each move being practiced in exactly the alignment and proportions as it would be applied in any push hands or fighting contact. But as the workshop progressed, something more than my aesthetic perceptions of the form began to make a big impression; something very different from what I was used to seeing, in the teacher student relationship. The teacher, Chen Zhonghua （陈中华）, would constantly be pushing with all of us. Not just demonstrating, as in “ideal scenario” stuff. Real, competitive pushing, with no holding back from the student. Sometimes this could go on for quite awhile, into the night, with always the same result, the student being thrown out, or onto the floor, in a myriad of variations. This inspired me to continue with the practice, and motivated me to seize the opportunity for participation in a “Full Time” training program for 3 months in Daqingshan, （大青山）,China, in the summer of 2007. My interest has continued with attendance at more workshops, whenever the opportunity presents itself. I have seen so many students, many of them martial arts devotees for 10, 20, or even 40 years or more, some quite skilled, and champions of various competitions, (many of them weighing in anywhere from 180 to 300 pounds or so) —— going up against this middle aged man who is five feet 3 inches tall, and weighs around 135 pounds. I have yet to see Chen stumble even slightly, in any of these encounters. Now, some simple perspectives emerge from this very “practical orientation” of the Chen Style Practical method. Can we identify the crux of the whole underpinnings of this art, and dig into some very basic, long held tenets? How can someone “smaller”, “weaker”, “older”, or any other disadvantageous position in a confrontation, apply the Taiji skills to prevail? What are the bottom line unique qualities of Taiji, which might truly enable us to achieve this ideal, in real world situations? I was grateful to get the opportunity to ask Chen Zhonghua to consider these questions. JB: Taiji proponents often suggest the ideal, that a smaller, older, or less athletic person could employ Taiji to defeat a bigger, stronger, younger, or faster opponent. Can you define the principles and the means to achieve the ideal? Can it be taught? CZH: You raise a good point, about using a small force to over come a large force. This is the concept often referred to as “Four ounces trigger 1000 pounds”, (四两拨千斤) in Taiji classics. This is certainly an important objective for the Chen Style Practical Method. The choice of terms, “Practical” Method”, reflects the primary emphasis we strive to incorporate into a consistent and structured practice. Our primary focus is to produce real fighting and push hands skills. The term, “Practical Method”, without any disparaging sense towards other methods, only distinguishes the method from other systems of Taiji, which may favor abstract or subjective definitions or theories. We emphasize concrete objectivity and universality of terms, methods, objectives, and anything else related to the teaching, learning, and applicability of the method. J: Are you referring to objective rules? CZH: It is objective. Practical Method includes curriculum, stages of instruction, and training of specific techniques, which are demonstrated and taught, with repeatable actions known to produce intended outcomes, whenever they are applied correctly. One such objective includes ability to overcome large force with small force. Approaching this objective, the formulation of Practical Method adheres to strict design for an underlying “unity” and a “universality” of the steps of application of its techniques. We identify a central core principle which is constant in every single movement, and every single application of various techniques of the method, which will be the same for the teacher and for all students. J: Can you define that central “sameness”? CZH: Yes. In Practical Method, at the deepest level, the core of everything is rotation （旋转）. The #1 principle of Practical Method is rotation. In the strict sense of the word, true circular rotation in the human body is not achievable. Of course, people can say they “rotate”. But, obviously, in scientific terms of geometric structures, the human anatomy cannot conform to the precision which would conform to perfect proportions and relationships, of perfect spherical interactions. In any definition conforming to scientific language, rotation must involve movement in place, without displacing space, not moving into a different space. In taiji language, it is called “movement without moving”. To relate the technical term “rotation” to what we do in taiji, we must observe that movement requires a core axis, which remains fixed in space. While any part of that stationary object moves, the core axis itself cannot move horizontally in space. Again, the human body clearly is not designed to create this type of action. JB: Yes, but isn’t that the usual understanding of everyone, about Taiji, that all the movements are circular. CZH: Sure, we all like to believe we can do it. But the human body is not equipped to rotate. Many things in daily life rotate. A blender rotates, a car wheel rotates. A door hinge rotates. You don’t have to re-define anything to observe true rotation. We might say that the closer one comes to “approaching” the capability of a true rotation, the greater would be their power. But to simply imagine that our movement is circular, or to move in ways which give the rough external appearance of “circular” movement, will never equate with true taiji skill. Acknowledging the dilemma that human bodies are not made like wheels, or blenders, we must seek out an expert and say, “Look, there are no parts on my body that were designed to rotate. Can you teach me a method to achieve rotation?” Then you must dedicate to training, to develop the skills of that method. Striving for the ideal of true rotation is a matter of degree, if a person “approaches” that ideal. Aspirants must recognize that the ideal is unattainable. The extremely rare individual, a little bit closer to the ideal, will be light years ahead of everyone else. JB: What qualities reflect “closer to the ideal” of rotation? CZH: Simple. Rotation generates a center, which does not move, while everything else rotates around it. Humans cannot do that. Even with training it cannot be accomplished. JB: Even if it appears a person’s spine is staying centered and straight up, and the rest of the body is opening, closing and moving around the spine, with the spine not tilting, or moving forward, backward or sideways—are they only “closer” to the ideal than others who do not have that ability? CZH: Perhaps, in outer appearance, someone might move in a way that seems to be “circular”, or even producing “rotation”. Then it must be tested, demonstrated in application. If someone proves it in action, that would be the person displaying high level ability. JB: What makes this type of action superior? What advantage results from it? What are the mechanics which produce that advantage? CZH: We can define rotation in terms of its function, as a “continuous lever”. A lever is used for a single action. A rotation is a lever which never stops. Therefore, we might achieve it functionally, if we can create a lever on the body which never ceases. That is the most a person can achieve. The approach of Practical Method, is to train functional capability in usage of a lever, as a fraction of a rotation. With this lever, we establish a point on the body which remains fixed, not moving in horizontal space, while the other parts conform to that fixed point, while engaging in their actions. This view “redefines” rotation in terms of achieving its purpose, by means of continuous, non stopping leverage. So we create a lever, using our body. This is the starting point for training in Practical Method. A student attaining this capability can then understand how a small force can overcome a large one, using the lever. J: How would a person use that in push hands or fighting? CZH: It is not some “thing”, or technique that you “use”. It is a level of skill which has become ingrained. That’s why tai chi push hands skills are appreciated as dependent upon Gongfu. Gongfu is residue of trained ability, not merely technique. When your body possesses that, whatever you do will incorporate that ability and express that power. CZH: We view the process for development of Gong as being dependent upon developing ability for correct usage of activities of joints. Attainment of Gong is not easy. People use their joints throughout life, yet they may never gain awareness of the correct usage, for better health or martial skills. Ability to differentiate separate motor skills, to isolate specific joint movements or muscle groups, or other unique coordination tasks —- all these challenges must be overcome to reach higher levels of skill. Most practices only enhance training of muscles, ligaments and other types of normal power. Stretching the joints open, moving and rotating them, won’t provide feedback useful for development of taiji skills, nor facilitate cultivation of unique requirements for Gong. The challenge is to derive efficient methods for correct training. One must persist in working on the joints. When joints move in effortless, coordinated manner, always sensitive to required adjustments, the skilled practitioner can demonstrate ability to transmit 100% of the power at all angles, without being overcome by the weight of incoming power. The quality of joint activity should function like “CV joints” of automobiles, capable of rotation at precisely correct angles for neutralization and redirection of any incoming force. From the perspective of “CV joints”, power transmission doesn’t depend on force. It depends on manipulation of both sides of the joint by adjusting to angles and spatial variations of each side. We intensify our focus towards Gong. Long time practice must utilize the best methods for training. Training skills, for effective employment of the joints, must be prerequisite for attainment of Gong. [JB: In subsequent sessions, Chen elaborated further on focus and practices, to eventually manifest abilities to produce outcomes of “rotation” in Taiji applications. His experience with his master, Hong Jungsheng (洪均生), provided graphic examples of concrete results of high level rotational skills. He also compares this with similar effects demonstrated in pushing with Feng Zhiqiang (冯志强). CZH: The performance of Taijiquan constantly engages the body in circles and circular motion. These circles are not simply turns in various directions. Each circle has its own specific size, connective sequence, and rules of motion. Observing all the circles as a whole, circles appear extremely complex, difficult to understand, and more difficult to construct. If we isolate each individual part and action, they become more accessible. Through long term practice, circles contribute to an experiential understanding of the spiral motions of Taijiquan. The purpose of these two (positive/negative) circles is to eventually entrain this skill throughout the entire body. When all the joints are moving in their appropriate positive or negative circles, the whole body will be able to function as a "gear box" （齿轮箱）. When all gears in the gear box engage, no single gear can move without involving all other gears. When all gears are disengaged, the movement of one gear will not affect other gears. If one’s body is transformed with ability to function as this gear box, one will be capable of demonstrating "one part moves, all parts move." With this skill, the body structure will remain intact while movements are free. During summer of 1994, I had a chance to push into Grandmaster Hong's chest. I issued power suddenly and felt as if my hands had entered a gear box. They were twisted and propelled back. I was thrown out and downward so quickly, I hurt my hip. I suffered over ten small fractures to my fingers and wrists. The hand injuries were from Master Hong's chest, and the hip injury was sustained from my fall. At the time, Master Hong was 88 years old and paralyzed from the waist down. He could stand on his feet but he could not walk. I have experienced similar power in push hands with Grandmaster Feng Zhiqiang. Master Feng does not call this phenomenon a "gear box". He calls it "The 18 balls of the body （全身18球）." I personally feel they are different names for a similar skill. Forms in the Practical Method of Chen Style Taijiquan are comprised of variations of the two circles. We can say that Taijiquan is movement and relationship of the two circles. The two circles provide a general guideline for learning Practical Method. All movements are either a Positive Circle or Negative Circle. (In reality, there are no complete circles. All movements should be either part of a Positive Circle or part of a Negative Circle). JB: When you speak of a constant lever, can you give concrete examples to help readers understand how the skill might manifest and develop through the practice? C: I once asked Hong about the “Taiji Energies” as people use the term. Hong’s answer was not the usual theoretical answer. As always his emphasis referred to usage in terms of practical outcomes. 1. In the first energy, imagine a wheel spinning on its hub. If you were to touch it, you would feel the effect of touching the outside of the tire when it is turning. It could bounce you out, it could pull you in, or it could “crush” you, push you or do other things. As the wheel is spinning very fast, if you touch it in different parts of the tire, many different things could happen as a result of this one type of energy. If you touch the lower part at the front of the tire as you face it, its effect would be crushing you downwards onto the ground. If you touch the back it pushes you upwards. If you touch the exact middle, it throws you almost horizontally out. The outside has outward spinning centrifugal force which will bounce you. This one single energy might repel you in many directions in different ways. That is the first energy. 2. The second energy would be felt if you were to touch into the inside of the tire, just inside the outer part of the wheel. It will generate an entirely different type of energy. It will pull you in different directions depending on where you touch it. 3. The third one would be the effect of placing your hand in between the spokes of the bicycle tire. It would basically crush and thrust you like a blender. If you grasp Hong’s descriptions, you will appreciate the superiority of Gongfu compared with emphasis on specific techniques. When you can create a “rotation”, your body parts act in the manner of the tire. Contact with that rotational structure will throw opponents like the outside of the tire, or they might pull your opponents like the inside of the tire, or catch your opponent like the spokes in the tire, crushing and pulling, wreaking havoc. Hong summed up the Taiji Energies in these examples. Anything else would be viewed as merely a technique to bring out these energies. JB: This brings us full circle, to gain better appreciation for a concrete perspective on the meaning of the “indoor” side of Taijiquan. How can we overcome impossible odds? In our weakness, how can we overcome strength? Is this an indoor secret of Taiji? Or can we simply seek from one who has cultivated the skills and can and will demonstrate them freely —- to enter the door by means of practical emphasis and concrete work, and constant refinement of our physical capabilities, to cultivate Gongfu, to achieve whatever we can of the impossible ideal of true rotation, while in this mortal frame—-to embody the core principle of that ultimate ideal. This is an incredible article that I will have to keep re-read again and again. What really struck me was the definition that Chen Zhonghua brought out for rotation, “rotation must involve movement in place, without displacing space, not moving into a different space”. “…without displacing space…” really stood out. In my mind, this implies that what one may have thought as rotation of the human body as spinning an axis in space, say with a ballerina performing a pirouette for example, is NOT rotation. A pirouette displaces space (imagine arms and legs making the full circle from the torso and hips). Please correct if my understanding is wrong. Now, how does a rotation in the human body feel and how does one even achieve a fraction of a rotation? I’ll have to keep practicing to find out. Thank you Chen Zhonghua and John Brown for your time and dedication in compiling this amazing article.